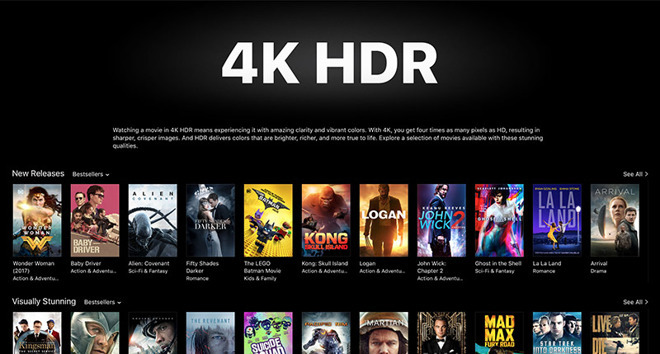 Ahead of Friday's public release of Apple TV 4K, Apple on Wednesday updated its iTunes Store with a special section dedicated to available 4K HDR movies, content that highlights the new set-top streamer's high-definition capabilities. Available for perusal in iTunes on iOS and macOS, the special category, named simply "4K HDR," provides a list of more than 100 movie titles that support 4K resolutions and some ilk of HDR color space rendition. "Watching a movie in 4K HDR means experiencing it with amazing clarity and vibrant colors. With 4K, you get four times as many pixels as HD, resulting in sharper, crisper images. And HDR delivers colors that are brighter, richer, and more true to life," Apple says. Apple's selection of 4K content is split into six sections: New Releases, Visually Stunning, Action & Adventure, Drama, Comedies and 4K Movies. The latter category appears to be catchall list of both old and recent releases including "Independence Day: Resurgence," "The Dressmaker" and "Batman v Superman: Dawn of Justice," among others. Today's iTunes Store addition comes less than a week after Apple began rolling out initial support for 4K HDR movies on iTunes. Not publicized at the time, high-definition content started to appear in user libraries and as a purchase option for select new release films. With the "4K HDR" promotion, Apple is making preparations for this week's Apple TV 4K debut. Unveiled during last week's iPhone event, the device packs in an A10X Fusion system-on-chip capable of outputting video at a resolution of 3,840-by-2,160 pixels, with support for a number of HDR standards. In conjunction with new Apple TV hardware, Apple announced agreements with major Hollywood studios that will allow the company to offer 4K movies at the same cost as 1080p HD versions. Those deals are evident in today's 4K HDR section. Along with new purchases and rentals, customers will benefit from free 4K HDR upgrades of previous HD purchases through an automatic update process.